Record your voice, your fridge, your neighbour's dog or let your computer speak and make loops and rhythms out of the sounds immediately. RealBeat concentrates on simplicity and fast results. No steep learning curve or cluttered screens! Get creative in an instant! 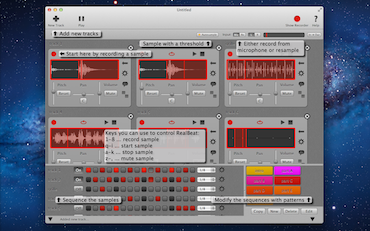 RealBeat is a sampler software that enables you to record sounds, cut and loop them and create rhythms out of them. 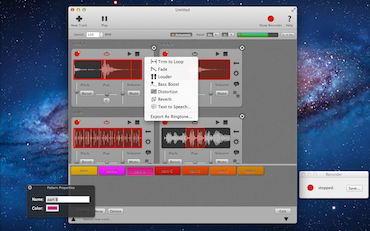 It also features an easy way to let your computer speak in different voices and use it as a source material for rhythms and loops. Finally you can export created tracks as ringtones to your iPhone (via iTunes). how to create a ringtone. a mini tutorial on how to create a short phasing experiment with a short phrase inspired by Steve Reich's composition "It's gonna rain". a mini tutorial on how to create a piece inpired by Alvin Lucier's work "I am sitting in a room...". 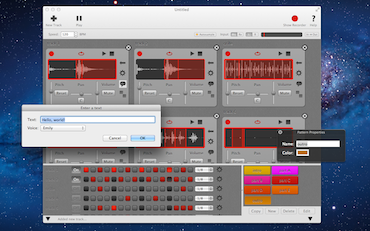 RealBeat for Mac is not a fully fledged sequencer or sound software it rather offers simple and fast access to sampling and manipulating recorded sounds live or at home. 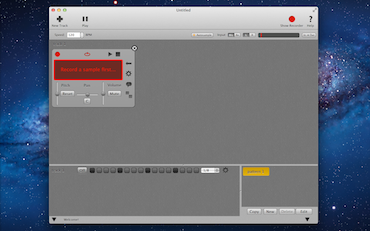 Don't expect a feature-laden software but lots of fun with your own samples & sounds.